The next French Pilgrimage, in 2019, to St Thierry, Rheims, Domremy, Orleans, Troyes is scheduled for June 21-July 1, 2019. Check their links for information and pictures. Check their links below for information and pictures. At St. Joan's re-trial there are numerous accounts from her fellow villagers that tell of the many times when St. Joan would take care of them when they were ill. The most vivid memory that I have of this long ago time, are the rare occasions where I was able just to sit quietly by my patients as I held their hand. It is my hope that people who are seriously ill with Cancer or with any other debilitating diseases will find within the pages of Ms. Lynn's book the COURAGE and HOPE to continue their fight to live. In Loving Memory of a Dear and Good St. Joan FRIEND and DEVOTEE, Mr. Jerry W. Crouch. May You be with JESUS and Our Dear Good Friend, SAINT JOAN, for all eternity! 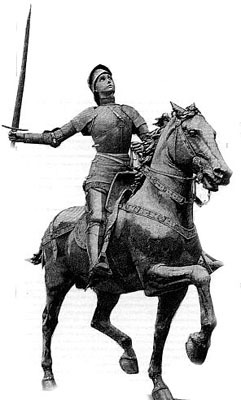 The purpose of this center is to spread information about and devotion to Saint Joan of Arc. Joan of Arc, Queen of France? This website has a number of very interesting articles. 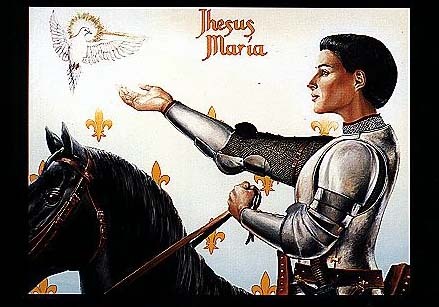 St. Joan of Arc- The Life-Story of the Maid of Orleans. by Rev. Denis Lynch, S.J. Life Lessons from Blessed Joan of Arc by Father Bernard Vaughan, S.J. This is a fantastic website with an incredible amount of information. The first page listed is its site map which lists every page on the web site. The other web pages are articles he has that I think are important. Was St. Joan the First Protestant? St. Joan - The First Protestant?? Joan's Attire-Did she always wear men's clothing? Was Joan Raped in Prison? - by Judith Fein, Ph.D.
64 Poems by Edward R. Paul, Jr.
review by Mike MacCarthy's of his own book "Joan of Arc: God's Maiden General"
A review by Mike MacCarthy's of his own book "Joan of Arc: God's Maiden General"
I was six years old when the Lord planted the seed that would later in my life develope into my devotion to Saint Joan. LIFE Magazine had a cover story about an Irish actress, Siobhan McKenna, who was playing 'Saint Joan' in Bernard Shaw's play of the same name on Broadway. I remember toddling over to the 'Chinese chest' where my parents placed all their magazines and newspapers and there I saw a woman wearing a helmet. I was intrigued by this and began to leaf through the magazine's pages until I came to a series of photos connected with the play. I could not read at the time and so I concentrated on the pictures. I was amazed and fascinated by one picture in particular, which showed the actress running in armor as she carried a sword high over her head. Day after day, for as long as my parents kept this magazine, I found myself going back to look at and study these pictures. It was as if I were trying to burn an imprint of them into my mind. I was playing with it outside my Bronx apartment building when a man came by and asked, "Are you a boy or a girl?" "I'M A GIRL!" I proudly answered. In reply the man said to me, "Girls don't play like that." I learned that I had to keep this a secret and so from that time on I did not play with my armor outside of my bedroom. As a child I was frequently sick. When I was well enough I would spent many a day on the couch watching TV. At the time channel 11 of New York City had a program entitled The Million Dollar Movie. During the day this station would play the same movie at least three times in a row. Not only that but the movie was repeated for a full seven days! When I liked a particular movie I would watch EVERY showing of it. I drove my mother crazy and she would say, "Are you watching that again! I would think by now you would know every word by heart. Don't you ever get tired of watching the same old thing?" From all this movie watching three movies stand out in my mind, THE LAST DAYS OF POMPEII, HOLD THAT GHOST, and Otto Premiger's SAINT JOAN. For the most part my interest in Saint Joan lay dormant in my heart. So when I turned twelve, the time of 'hero worship,' I rediscovered Saint Joan. "WOW! A woman, a knight and a leader of men! She's my kind of girl!" I renewed my friendship with Saint Joan with a passion. I read everything that I could get my hands on, so long as it was about Saint Joan. My mother would say to me, " Are you reading about HER again! Don't you ever get tired of reading the same old thing?" I explained that it was not 'the same old thing' because each author had a different twist or interpretation to her story. Not only that but I never tired in rejoicing at my friend's victories nor in sharing in her passion. 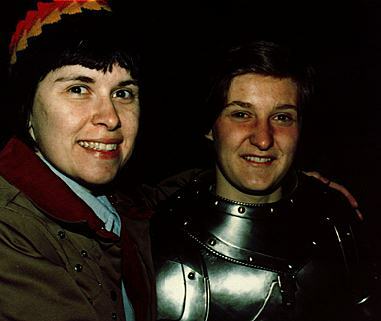 When I first started to develop a friendship with Saint Joan I was very formal and would address her as 'Dear Saint Joan of Arc.' I soon shortened it to 'Dear Saint Joan' until finally it became 'Hey Jo!' or just 'Jo!' I loved to talk to her and tell her everything that was happening to me, the good as well as the bad. She was and is my very best friend, a person in whom I can, without shame, confide everything. I loved to imagine myself (and still do) as her comrade-in-arms riding along side her through thick and thin. I would imagine myself giving King Charles a swift 'boot to the head' for his betrayal of her. As for Bishop Cauchon I would have no difficulty slapping him around. THE BUMS! This film concentrates solely on Joan's trial and death. The version that I have seen is the one that Dreyer calls 'inferior.' Even so it is very INTENSE, so much so that the viewer is left emotional drained at the films conclusion. I can only imagine how intense the recently found version must be, especially combined with Richard Einhorn's VOICES OF LIGHT. The original version of Dreyer's film combined with Einhorn's music is available for purchase by the general public on VHS tape. This film follows Joan's life from Domremy to her death in Rouen. It is the most historically correct film on the subject that I have ever seen. Even though it has its short comings, I always enjoyed watching it for its overall beauty and poetry. I just love the battle scene. I first saw the 100 minute long version of this film on TV back in the sixties and it so excited me and filled me with visions of Joan that I could hardly sleep that night! Hopefully in 1998 we will be able to purchase for ourselves this fantastic film in all its glorious 155 minute length. I can hardly wait! This film is based on Bernard Shaw's play by the same name. The film follows Joan's life from Vaucouleurs to her death at Rouen as well as her 'visit' with King Charles. As I explained at the beginning of this essay, it was this film that reawakened in me my love for Saint Joan and every time I had a opportunity to view it, believe me, I did! I enjoyed Joan's interaction with Sir Robert de Baudricourt. I really enjoyed Richard Widmark's portrayal of the Dauphin. I liked the scene in the cathedral between Joan and Dunois. The trial was good and the scene where Joan died was moving. But what I liked about the movie the best was the 'dream' sequences dispersed through out and at the end of the film. These films can be purchased in France. I have just recently seen them, (of course they are in French) and I was VERY DISAPPOINTED. The battle scenes were LAME, ridiculous and unbelievable in their portrayal. As for "Joan," Rivette and the actress who portrayed her stripped the REAL Joan of all her spirituality and in so doing they cut the real Joan's heart out. The woman they portrayed WAS NOT JOAN but some woman going through the motions. At the end of the movie when 'Joan' was dying Rivette was so afraid of 'OFFENDING' anyone that he showed a plain cross amidst the flames instead of what really was held up before her, A CRUCIFIX. I can now see why this film was not given a bigger showing here than it was - it would have BOMBED - big time!!!!!!!!!!!!!!!!!! Can you tell that I really did not like these two films? Giovanna D' Arco - 1989 Italian Film of the Opera by Giuseppe Verdi. This film is about a barmaid named Joan who helps some British and a Free French flyers escape Nazi controlled France. How Saint Joan is incorporated into the film is the fact that she is the barmaid's patron saint and gives the barmaid the courage to face the Nazis. I would have liked it better if the director had explored this aspect of the story more but he did not. This film is about a small town girl making it good in Hollywood by replacing the famous actress who walks out of the production of Joan of Arc. She auditions for the lead by recreating Joan's trial scene in her living room before the studio's publicity man. That part of the film was moving and I enjoyed watching it. She gets the part but dies of 'black lung' the day after the film is completed. In this version of the story the man who became 'the Phantom' was a composer. He wrote an opera about Saint Joan. It was stolen from him and so when the thief tried to produce the opera 'the Phantom' did his best to disrupt the production. I liked all the operatic scenes except for the trial where Bishop Cauchon was singing, that I felt it was too ponderous. Yet Joan's reply and her going to the fire was very moving. Bill and Ted kidnap 'Joan' from 1429 Orleans and bring her into the future. The film shows Joan helping the 'boys' by doing some house work with the other historical figures that they had rounded up. Bill and Ted take Joan and all the other historical people to the San Dimas Mall. Here Joan disrupts an aerobics class by pushing aside the teacher and taking over the work out. I loved it! My only wish was that Joan had been given more air time. The article that I read about the movie explained that they had Joan playing with Billy the Kid's wolf and singing with the San Dimas High School band but these scenes were cut because of time constraints. I Pledge Allegiance To The Lamb - Ray Boltz's music video - American 1995. This is a Protestant music video. Near the beginning of this song Mr. Boltz shows 'Joan' being brought before the English King. When Joan refuses to give into his demands, she is dragged away to be burnt at the stake. I am glad that he was tactful enough to have the 'bad guy' portrayed as a king and not as a bishop. This is a very moving video, well worth the viewing. Wishbone's Bone of Arc - American 1995? Wishbone is a children's series made for PBS. In this series a book reading dog by the name of Wishbone takes us into the book's story. In Bone of Arc Wishbone takes us into Mark Twain's Joan of Arc. The dog portrays Joan's good friend 'Louis.' The video shows Joan under the 'Fairies Tree,' finding the Dauphin amongst his courtiers, the victory at Orleans and her imprisonment at Rouen. I enjoyed watching. This "picture (170K)" is a stereogram of our brave Saint Joan with her pennant. 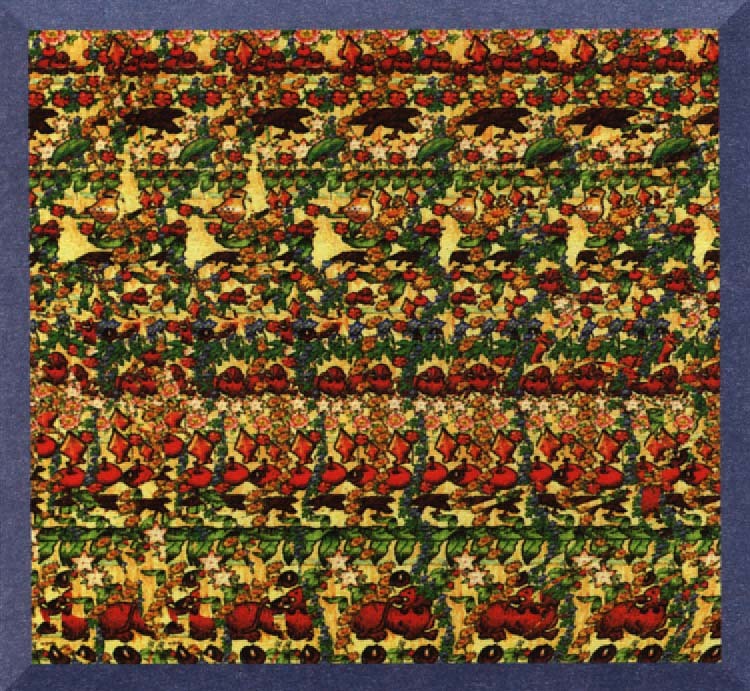 To see a stereogram on your monitor, focus on your own image that is reflected on the glass. Then, without changing your focus, shift your vision to the picture itself.